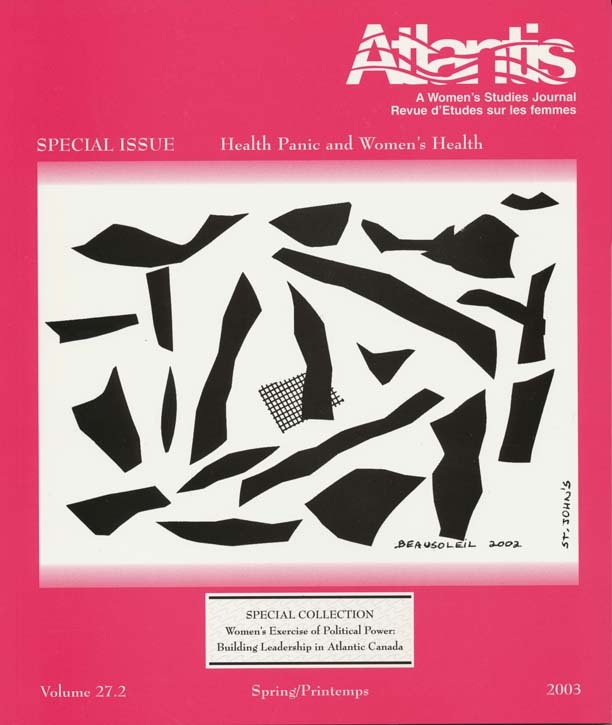 Introduction to "Health Panic and Women's Health"
Representations of Endometriosis in the Popular Press: "The Career Woman's Disease"
Media in the Maritimes: Do Female Candidates Face a Bias? Women and Slavery in the French Antilles, 1635-1848. Bernard Moitt. A Gregarious Culture: Topical Writings of Miles Franklin. Jill Roe and Margaret Bettison, editors; Letters of Gwen Harwood 1943-1995. Gregory Kratzmann, editor. Paddling Her Own Canoe: Times and Text sof E. Pauline Johnson, Tekahionwake. Veronica Strong-Boag and Carole Gerson; How Should I Read These? Native Women Writers in Canada. Helen Hoy. Higher Goals: Women's Ice Hockey and the Politics of Gender. Nancy Theberge. Inside Organized Racism: Women in the Hate Movement. Kathleen M. Blee.